Sold by Swapware Games and Fulfilled by Amazon. Gift-wrap available. Your Memories Shape the Present – The choices you make in your memories will affect the story in the present. Change the outcome based on how YOU remember things from flashbacks! A Heartwarming Tale of Bravery – Light-hearted comedy and heartfelt storytelling intermingle in a send-up to the bests in this modern classic. A Love Letter to Classic RPGs – From the 16-bit style to the retroinspired music, this is a game made by fans of RPGs of yore to fans both young and old. Our hero faces the origin of all evil, the Overlord himself, but suddenly loses all memories of his adventure. His finishing moves, the name of his hometown, and even the reason he's trying to defeat the Overlord in the first place, all gone. Our hero feels as though he's letting his allies down In the midst of battle, his ally's words and the Overlord's taunting triggers flashbacks, bringing his memories back piece by piece. Our hero tries to regain his priceless memories before it's too late, but the Overlord stands before him, his power unyielding! 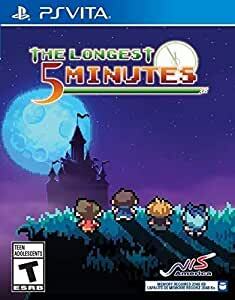 What can happen in The Longest 5 Minutes!? Your Memories Shape the Present The choices you make in your memories will affect the story in the present. Change the outcome based on how YOU remember things from flashbacks! A Heartwarming Tale of Bravery Light-hearted comedy and heartfelt storytelling intermingle in a send-up to the bests in this modern classic. A Love Letter to Classic RPGs From the 16-bit style to the retroinspired music, this is a game made by fans of RPGs of yore to fans both young and old. 1.0 out of 5 starsConfirmed that PS Vita even with choice of different platform. This is just the PS Vita game. I thought that choosing the platform as Nintendo Switch would be a Nintendo Switch game. Don't buy unless you need PS Vita game. Edit : I contacted Amazon about issue, and I was told that they would send Nintendo Switch game, but I received another Vita copy. My guess is that there's a disconnect because of how this item is named with "PlayStation Vita" in the title and the actual platform choice isn't carrying over.